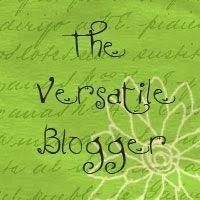 Patti over at A New Day Dawns for honoring me with the Versatile Blogger Award. It’s my first blogging award. The first rule of accepting this award is that I link back to Patti’s blog, which I just did. (Please visit her site. She’s a wonderful, supportive blogging friend.) I am also to reveal seven things about myself, and then pass the award on to other new bloggers. 1. My father died when I was eight months old. There are no pictures of the two of us together. 2. I became an aunt when I was 2 1/2 years old, and a great aunt at 21. 3. The high school I attended was so small, there were only 23 in my graduating class. 4. I don’t eat seafood….of any kind. 5. I’ve never had a traffic summons….of any kind. 6. I’ve never had a broken bone. 7. I’ve never lived more than 20 miles from my childhood home. Please stop by and pay each of them a visit. You just might make some new friends!